Asiana Airlines continues to work towards launching an unnamed low-cost carrier to be based in Seoul, enabling Asiana finally to participate in the budget growth enjoyed by Korean Air-affiliated Jin Air and independent Jeju Air. The LCC would be Asiana's second after Air Busan, based in Korea's second-largest city. Air Busan is showing restrictions with a high cost base while Asiana, with a minority 46% stake in Air Busan, has limited say. Asiana intends to have majority ownership of the Seoul LCC. Flagged for the LCC are thinner markets to Japan where Asiana is weak. Asiana's Japanese yields have fallen and has previously announced an all-economy configuration for short-haul services; but this appears also to have had limits and Asiana needs a step-change solution. Asiana has long worried it was over-exposed in the short-haul market, which it foresaw becoming more competitive. Long-haul growth with A380s and A350s was one measure to rebalance, and the Seoul LCC should further help. But Asiana must ensure the LCC can pursue valuable opportunities and not just be allowed to serve weak routes. Asiana mooted launching the LCC in early 2014. At the time, Asiana noted time was needed to sort through the complexity of having a new airline vis-à-vis Air Busan. Asiana has a minority stake in Air Busan, based in Korea's second-largest city of Busan, and Air Busan shareholders were concerned that Asiana having a new LCC based in Seoul would limit Air Busan's opportunities. In Jan-2015, an Asiana spokesperson told the Korea Times there was now a delay to the airline owing to a difficult environment: "The scheme hit a glitch following a crash in San Francisco in 2013. But we are continuing the project for a desired establishment this year." The regulatory environment has not been kind to Asiana. Korean regulators intend to sanction Asiana for its Jul-2013 crash in San Francisco, attributed to pilot error. In Nov-2014 Korea announced Asiana would be banned from the Seoul Incheon-San Francisco route for 45 days. Asiana is appealing. IATA, normally reflecting on the whole industry or specific regions, took the unusual step of directly addressing Asiana's situation. Director general Tony Tyler said in a letter to Korean authorities: "The imposition of further penalties by the state as an attempt to demonstrate oversight is disproportionate and unreasonable...absent deliberate, flagrant violation or sabotage, an aircraft accident should not be criminalized because criminalization of aviation accident investigations serves no useful purpose." Asiana no doubt finds it ironic that whatever damage Korean Air wanted regulators to impose on Asiana will be small relative to the backlash Korean Air is enduring from its also heavy-handed "nut rage" incident. Not only is there a large public outcry, but one of Korean Air's now former VPs (and a daughter of the CEO) faces imprisonment. There could also be discipline to less senior Korean Air officials. The largest long-term impact may be a wide investigation into Korean Air's relations with the government, perceived as too cosy (as Korean Air's competitors would maintain). Korean Air reportedly regularly offers complimentary upgrades to government officials, for example, although offering preferential treatment to politicians is not unusual in many jurisdictions. A more balanced regulatory environment would arguably hurt Korean Air but benefit other airlines. Asiana hopes regulators will recognise it will provide operational support to its LCC, perhaps boosting regulators' confidence in safety and other standards. But the regulators at the same time face what will be highly visible decisions on relatively unheard of matters. Asiana hopes to establish the airline in 2015 and launch flights "as early as next year" – a long lead time. Asiana's new LCC in Seoul illustrates the limits of Air Busan, 46% owned by Asiana with the balance owned by the local Busan government and businesses. The LCC has been a second-tier contender to independent Jeju Air and Korean Air-affiliate Jin Air, both based in Seoul. Air Busan continues to operate a mixture of hand-me-down A321s and classic 737s, with the small number of each aircraft precluding scale. Air Busan says in a regulatory filing it has seven Airbus aircraft (variant unspecified) on order through 2016, during which time Air Busan will retire its 737s. Firm orders include those placed directly by the operator and by lessors assigned to the operator, from 5-Jan-2015 onwards. Air Busan is also the only LCC to operate domestic routes not going to/from Jeju, a popular island destination that cannot be reached by Korea's high-speed train the KTX. The KTX plies the Busan-Seoul corridor, offering more frequency at typically shorter journey times and fares. Asiana has handed the route over to Air Busan whereas Korean Air serves the flight with its own metal. Jin Air, affiliated with Korean Air, does not fly between Busan and Seoul. While Asiana as a group may benefit from having a lower cost unit on what is surely an unprofitable flight, this does little for Air Busan's finances. Air Busan has upwards of 14 flights a day between Busan and Seoul Gimpo, in addition to nine flights from Busan to Jeju and six from Seoul Gimpo to Jeju. These approximately 29 daily domestic round-trips compare to about 11 daily scheduled international round-trips. Busan to Fukuoka and Osaka Kansai are served double daily but smaller points like Xi’an and Yanji are served twice a week. So while Air Busan's route map extends wide, the concentration is in the domestic market. Asiana's current CEO Kim Soo Cheon was appointed on 01-Jan-2014 and was formerly the CEO of Air Busan – so he knows first hand what the airline can, and cannot, do. His pressure at Asiana to develop a new LCC based in Seoul affirms the limits on potential growth for Air Busan. Some of this was already apparent from its small network and inefficient fleet. Asiana's official remarked of the segmentation: "The three carriers will have different roles ― Asiana, the premium service provider; Air Busan, a local carrier operating routes linking Busan; and the new budget carrier, which will have low-cost services based in Seoul." It is unclear if the wording was meant to be precise, but the statement about Air Busan ("a local carrier") suggests Asiana does not see Air Busan as an LCC, which Asiana uses to describe its new Seoul carrier. Official statistics and financials about Air Busan are not detailed, but from its operations and other factors like limited ancillary revenue, it would be difficult to call Air Busan an LCC. That Asiana potentially acknowledges this is an important, if overdue, step. The Seoul-based LCC would represent a firmer strategic move from Asiana in the short-haul market. 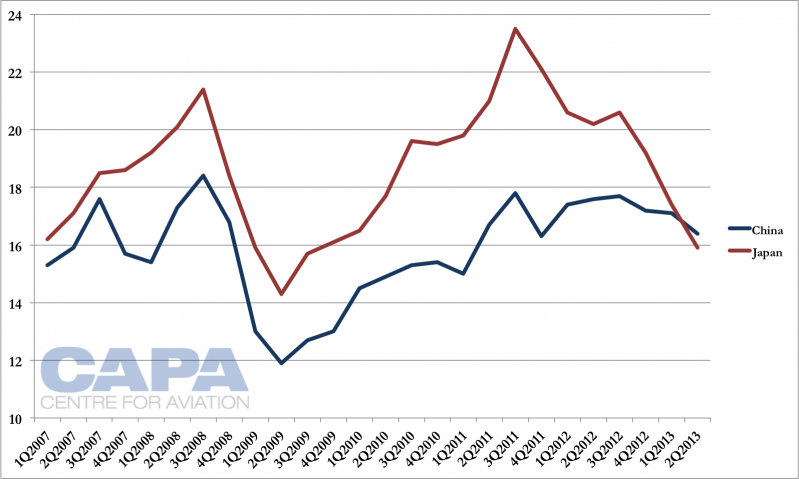 Asiana has been worried it is over-exposed to this segment with a likely deteriorating outcome as the competitive dynamics, such as from LCCs, increase. Asiana for some time has planned to grow long-haul (with new A380s and A350s) to re-balance. A growing proportion of long-haul services will enable Asiana to shift away from short-haul markets, in particular around North Asia. 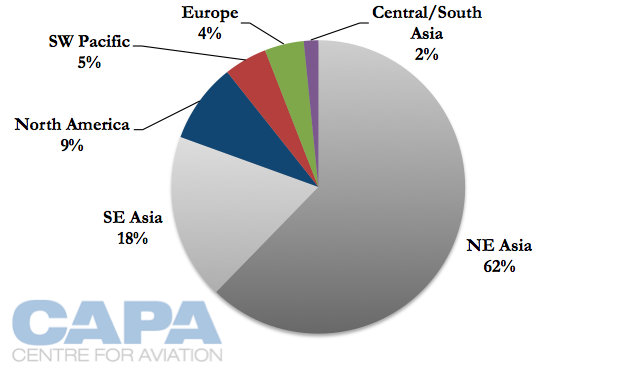 51% of Korean Air’s international seats from Korea are to North Asia; for Asiana this figure is 62%. Both have similar proportions to Southeast Asia (18-19%). 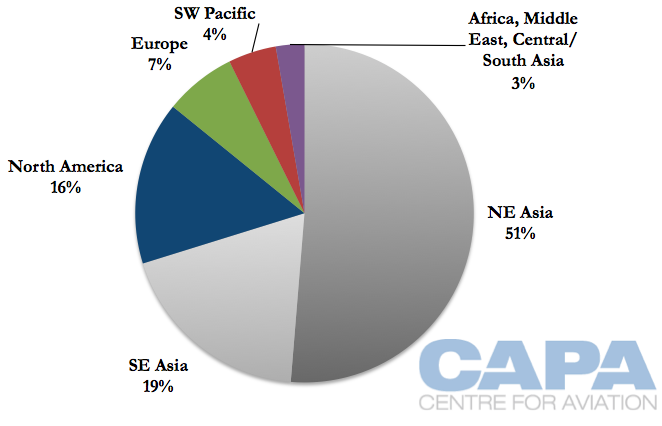 Cumulatively this means 70% of Korean Air’s network is around North and Southeast Asia compared to 80% for Asiana. Breaking these down into strict short-haul and long-haul segments is difficult due to point-to-point, connecting regional traffic and connecting long-haul traffic. Korean Air is more exposed to long-haul traffic, with 16% of its international seats ex-Korea going to North America (Asiana: 9%) and 7% to Europe (Asiana: 4%). Asiana said one international market for the Seoul LCC would be thinner Japanese points: "While we make profits from popular routes linking Korea and big Japanese cities including Tokyo, Osaka and Fukuoka, we have low occupancy rates for smaller cities such as Kumamoto. If the budget airline operates on such routes, it will be win-win for both Asiana and the budget carrier." A need for all-economy short-haul services surely had Air Busan's name on it. Offering these routes to the new budget carrier indicates Asiana found limits in its opportunity (as well as that of Air Busan) and a step-change was needed. Asiana no longer reports yield by market, but in mid-2012 Japanese yields began to fall. In Aug-2014 Asiana said the Japanese yield decrease was slowing due to the combination of additional outbound Korea demand and a stronger Korean won. Asiana reports it has 170 weekly frequencies to Japan across 20 routes to 15 Japanese destinations. 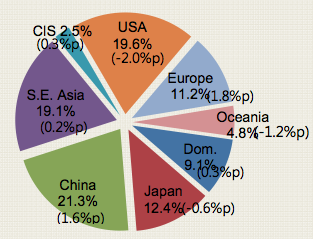 In 3Q2014 Japan accounted for 12.4% of passenger revenue (down 0.6ppt; traffic change undisclosed). 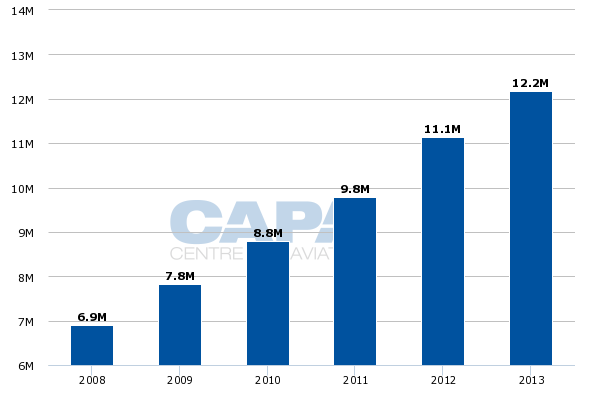 Passenger revenue accounts for 70% of Asiana's revenue. Asiana is identifying potential markets for the LCC but runs the risk of limiting the LCC by giving it Asiana's left-overs (even if the routes cannot be profitable for the LCC) or restricting it from Asiana's more profitable routes. The spokesperson noted Asiana was fine serving Osaka and Tokyo, but this should not necessarily preclude the LCC from operating there. Other LCCs – Korean or Japanese – will pick up the slack. Asiana also plans for the Seoul LCC to have domestic flights from Seoul Gimpo, and indeed the LCC would likely need to cut its teeth on domestic services before progressing to the international market. From Seoul, the only real market would be Jeju, but this route is intensely competitive with seven airlines offering high-frequency on what is the world's largest air route based on seats. Jeju Air offers upwards of 19 daily flights while even T'way, overall a small player in Korea, is large on the Seoul-Jeju route with upwards of 15 daily flights. The LCC would need to make a sizeable entry and be prepared for yield pressure. The Seoul budget market was already becoming competitive with Jin Air responding to Jeju Air's growth. Asiana has recognised the gains in Seoul of Jeju Air and Jin Air and hopes to finally partake in the Seoul budget market with its new LCC. It has been some time coming and still far from over, with a launch not planned until early 2016. Jeju Air intends to work up from a 17 aircraft fleet (all 737s) to 40 as early as 2018. Jin Air meanwhile has become the first North Asian LCC to use widebodies as it commenced 777 service between Seoul and Guam in Dec-2014. However, there is much left to be proven of this widebody operation. Although demand is increasing for Korea as a destination and the local population growing outbound travel, the budget market is fragmented. A strong move on Seoul from Asiana's LCC may finally force consolidation at the smaller carriers. But for now, the "next year" timetable for Asiana's LCC looks to give a little breathing space for the competition.